So, there’s another craft project that I finished on Saturday but haven’t shown you yet. It involves a set of black and white photograph postcards that I found in an amazing Florentine paper shop back when I was gallivanting and reading books instead of working and reading blogs about houses/cooking/gardening. (Wow, that sounds harsh. You know I love my life now, too, right?!) I knew I wanted to save them for something special, so I’ve kept them safely tucked away for almost four years. I started with 10 white 5×7 frames from IKEA, which not only required mats for the 4×6 postcards but also posed an additional challenge: they have no glass plates to hold the photos in place. So, my cousin Genevieve and I pulled a selection of patterned papers and picked out five – in various shades/patterns of red, aqua, black and cream – that matched the existing colors in the room where I planned to hang them. (I also didn’t want papers that would distract too much from the photos, and we were lucky enough to find some). Then, we made custom mats for each postcard. Each paper pattern was used twice – one for each side of the windows, since the set would be split into two arrangements of five frames each. We attached the postcards to the mats using old-fashioned black photo corners. This not only allowed me to preserve the postcards (as in, keep them safe from tape and glue) but also added an important visual element to tie the frames back to the rest of the room. Seeing these photos of Firenze every morning when I first wake up is an excellent way to start the day, I’ve learned. Having them in matching frames only makes my heart happier. Sometimes you just feel like making something. (Or, if you’re like me, a million somethings). You buy the supplies and you daydream about what it will look like when it’s done. But then, you don’t have enough room to spread out and work. Or you fill your weekend with other plans. Or you get started, and then you get stuck and you don’t have anyone to help you figure out what to do next, so you give up. Saturday marked the first of what I hope is many, many crafting days at the farmhouse. In fact, it’s something I had in mind from the very beginning of the house hunt. I fell in love with this basement from the get-go because it just had that creative space feeling. … Onyx was here to keep us company (and remind me how much I want a dog, even though that’s about the last thing I can handle right now). He had his paws in everything. Jen and I did some serious spray painting out in the garage (you might recognize the carpet remnant from the basement “before” photos). She had some great baskets that needed a fresh coat of paint, and I was working on an assortment of frames. Hope you’ll join us next time! That was when I saw the water start rising in the street. By the time I made it out there with my camera, the water was over the curb and halfway up my shins. The tree is also blocking one of the main roads between my house and the freeway. Which explains why my street has been a lot busier than usual tonight – although, I hear the freeway was flooded, too, so maybe it’s just as well that people couldn’t get to it. All in all, a pretty exciting evening here. I got to meet a lot of my neighbors when we were all out looking at the tree and cleaning up fallen branches in our own yards. The power was out for about three hours, so I’ve been enjoying the late evening breeze on my front porch, watching bugs on the ceiling in the flickering candlelight and listening to the last drops of rain. But I also convinced them to sell me the awesome black thing they were using to hang tablecloths on display. Turns out it is the side of an old crib. Let me tell you – I’ve been on the hunt for the perfect scarf hanger for about a year now. For a while I was picturing an old ladder, until I realized that wood slivers and rusty nails definitely do not mix with silk and cashmere scarves, carefully handpicked from market stalls worldwide and carried home in my arms. True story. So, the search continued. And I’m happy to report that my drilling and nailing efforts have so far kept it on the wall! I also found some amazing glass and wood lamps a few weekends back. They’ve been sitting on the bedroom floor, looking forlorn while I dealt with more important things like haunted washers and dryers and backyard bbq’s. But when I made my giant IKEA trip last weekend (more on that later), I found some lampshades for the forlorn lamps. And, coincidentally, some nightstands for them to sit on. So then I had to learn how to fix the antique lamps. It’s actually pretty easy, I learned, so long as the wiring is intact. All I needed was a little WD-40, new lightbulbs, and some hardware for the lampshades and on/off switches. I wish it had been more complicated – and therefore, exciting – but really, getting the lamps fixed up couldn’t have been easier. And just in time, too. The observant among you will notice some new bedding in these photos, and it’s true – I finally got my new mattress and am no longer sleeping in the polka-dotted guest bedroom. Hooray! I’ve always had a love-hate relationship with Father’s Day. I love my dad, but he’s notoriously difficult to shop for. So it can be stressful. But I have a new reason to adore this Hallmark holiday: hardware store sales. Every thing a girl could want for her new home seems to be on sale this weekend. And never fear, I got a nifty drill bit and driver set, too. So this year, my Father’s Day gift is learning how to do all the fix-it-up stuff around my house… so my dad won’t have to do it when he comes to visit. Pretty good present, huh? Which I think makes me Mrs. McGregor. Once upon a time, way back at the end of high school, my friends decided that I was probably going to become a jammer. That is, a jam lady. I never quite knew where they came up with this idea, but either I was destined to be a lady who makes jam or I just liked the name after they christened me as such. Because now their prediction has come true. I have made my first jar of jam. Let’s be honest, they’re really preserves, which aren’t as fancy (or complicated) as jam. But I get to eat the stuff on toast in the morning, and scoop it out of a Ball jar. So I’m thinking it counts. And now I’m going to share the love – sort of. I can’t give you all a taste of my delicious homemade rhubarb preserves (unless you come over to my house really really soon) but I will show you how I did it. Because it is seriously easier than pie. Color me shocked. so, has anyone else made jam? I’m ready to hear your tips! I think I’m addicted to this. I’m not sure how I killed the washing machine. Really. It just stopped working after I opened the door to add something. I thought maybe I could fix it by unplugging it… but apparently, what works for laptops and wireless routers does not exactly work for washing machines (even fancy new-ish ones). btw this is not what you want to be doing on a saturday night before a birthday party. I’m hoping my neighbors just think I’m hilarious, rather than weird, when I do things like hang laundry in the backyard and play country music all afternoon through my outdoor speakers. PS: this all happened last weekend. but since I don’t have internet OR a washer/dryer right now, this is what you get. both repairmen are coming today. so.excited. The garden is in! 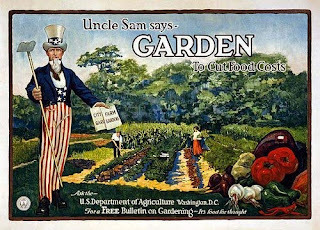 The victory garden, that is. 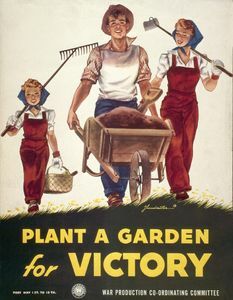 Not only because it will be a victory if it makes it through the summer, but because I have this daydream that during WWII, the person who lived in my house (whoever that was) had a victory garden too. 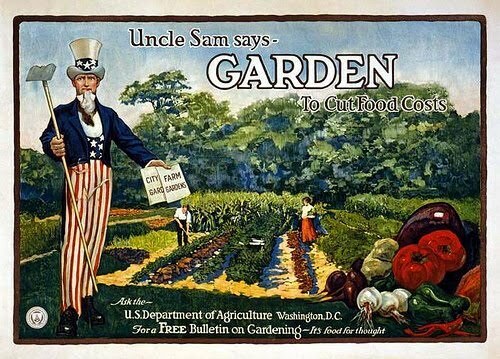 Not that I need a garden to compensate for government rationing or anything. It’s just a nerdy WWII history thing I’ve always wanted to do. Maybe it’s the cool posters – or Molly, the American Girl doll. Who knows. But now I have one! So what’s in this victory garden of mine, you ask? It rained on and off throughout the afternoon, but we didn’t mind. That’s right – we. I had some great help in the form of my friends Dan and Taylor. They helped me do neat things like move heavy planters from one side of the yard to another, shovel out extra mulch and build my compost bin. Last night, I got home from work at the amazingly normal time of 6:15. 6:15! The first time I’ve seen my house in the light of day in almost a week. No more moving, no more cleaning the apartment, no more plane flights and wedding events. So Backpacker’s Pasta saved the day. Backpacker’s Pasta is one of those amazing things that, once it entered my life, just never left. It started back when I was trekking around Europe with AW and BD. We all loved pasta, we all loved vegetables, and we all really loved staying in hostels that had kitchens so we didn’t have to eat out every night. We probably made pasta for dinner (which someone christened Backpacker’s Pasta) two or three times a week. Wherever we went, we’d stop in a grocery and pick up three or four kinds of fresh veggies. Didn’t matter what kind. Maybe a jar of sauce, if we were feeling fancy. The addition of meat usually depended on the state of the knives in the hostel kitchen. We carried a bottle of olive oil with us everywhere we went, so BP was always an option. Back on the home front, I make Backpacker’s Pasta at least a few times a month. No two batches are ever the same. As I start cooking more in the new kitchen, I plan to post lots of my favorite recipes. So now that I’ve eaten it for lunch today and dinner last night, it seems a fitting first recipe to post. 9. sprinkled with parmesan cheese (I’m a sucker for the cheap kind – it blends better than those big pieces of grated Parmesan you find in most deli cases). YUM. the big 1-1-5 … happy birthday farmhouse! Betsey on a treat for you from ALT! C. on a treat for you from ALT! C. on you’re in the right place!